There's just something fun about creating Christmas crafts for the Holidays and as I get geared up to start some projects; I look to some of my past projects for inspiration and wanted to share just a few of my favorites. I hope you like them too. Even if you don't have a lot of time, this one is quick and easy. for this Holiday ensemble I incorporated a few extras for some added pop. The dancer and box were stamped using the masking technique. Then a cut a slit in the tissue paper portion of the box to add the accents of real tissue paper and inserted the Harlequin figure using pop dots along with feathers as accents. 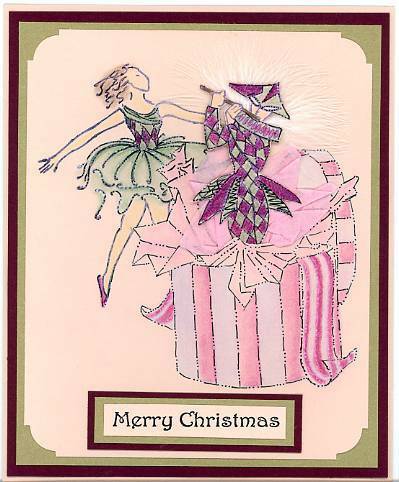 The two figures are by Judikins Rubber Stamps and the box is by Love you to Bits Rubber Stamps. The piece was colored with decorative chalks and pastel pencils. color scheme of burgundy, pink, green and gold. 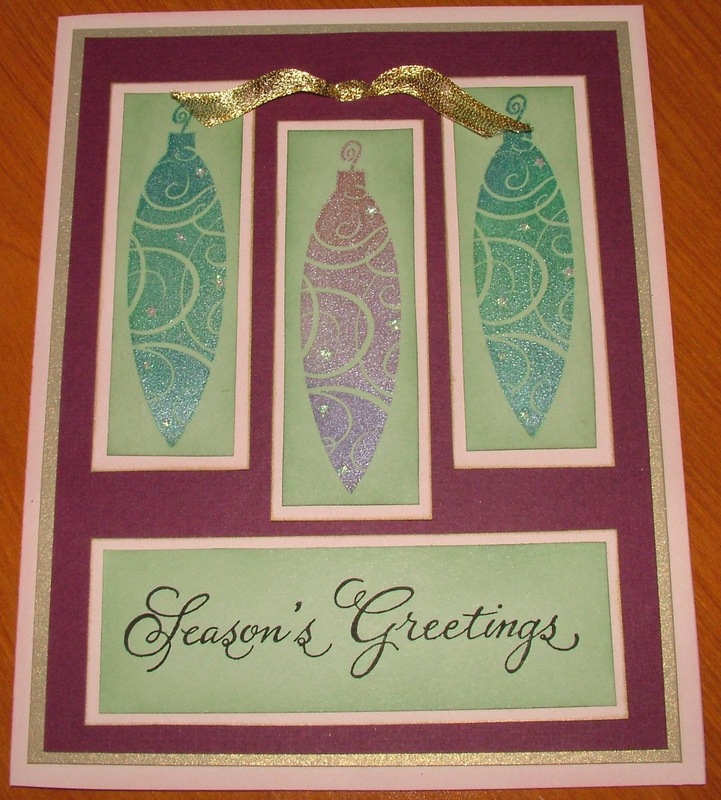 White cardstock that was sponged with decorative chalk became the foundation for the background and the ornaments. The ornaments were stamped and heat embossed with gold powder, then trimmed close into balls. The garland was extended across the card front by stamping it twice. It was colored with gel pens and glitter glue. Decorative gold ribbon was added for accent and the middle ornament was attached with a pop dot to make it stand off the card. 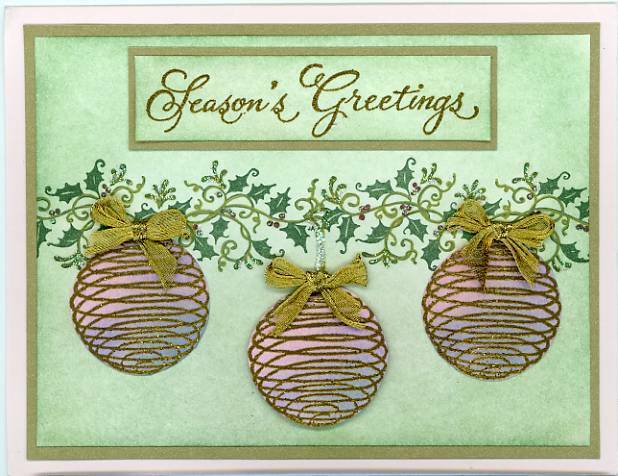 Ornament by Alias Smith and Rowe Stamps - Garland & Greetings by Northwood’s Rubber Stamps. Another Card using the Victorian Color scheme of burgundy, pink, green and gold. with a few glitter glue accents sprinkled here and there for extra pop. 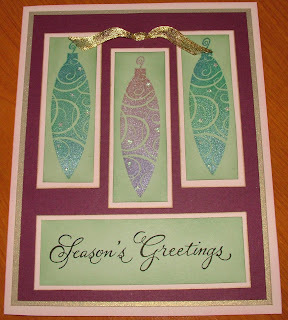 The ornament rubber stamps are by Hero Arts and the Greeting is by Northwoods Rubber Stamps. I thought this rubber stamp would make a fun 3-D ornament. I created this box shape you see here from pink cardstock. 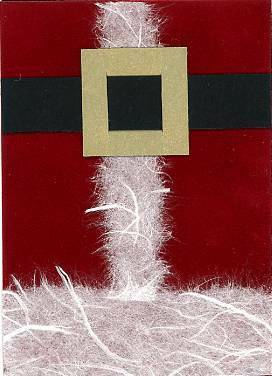 Each panel was stamped and heat embossed with gold powder, trimmed matted and attached to this three sided box shape. The bottom was also done with a trimmed down version of this same stamp. 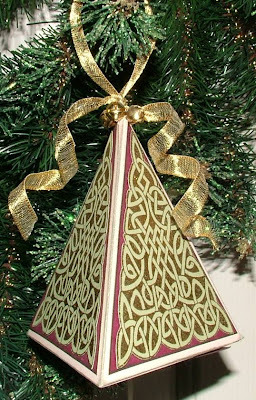 Some bells and gold wire ribbon were added for fun. Rubber Stamp is by Wordsworth.